The Lord God does not need any help to carry out His will, because He is perfectly capable of doing whatever He wills to do. However, in His wisdom, God chooses to use His messengers, the angels, as a means of interacting with and protecting men. The feast of St. Michael and All Angels provides an excellent opportunity for talking about the angels, perhaps mostly for dispelling common misunderstandings. Angels are mostly anonymous in Scripture, but some of them are known to us. 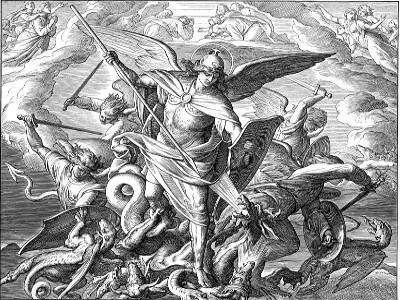 Jude 9 refers to the “archangel Michael,” and Michael also fights against the dragon in Revelation 12:7. Michael also appears in the book of Daniel, which appears to be the only reason why Daniel 10:10-14 and Daniel 12:1-3 are the Old Testament readings for this feast. 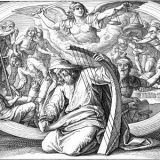 It is true that the most common “angel” in the Old Testament is the Angel of the Lord, which is a way of speaking of God Himself (Judges 6:22; 13:21-22). The angels in general, while appearing throughout the Old Testament, are only rarely the primary focus of a passage (Psalm 91:11-12 is one example). All of this should emphasize how little we know of the angels, which provides an excellent opportunity also for speaking about how we must remain silent where Scripture does not speak. Even with this understanding, however, the readings from Daniel, chosen because they refer to Michael, violently rip up their context and lead to several misunderstandings. They are part of the last major section of the book of Daniel, beginning at Daniel 10:1. This vision comes to Daniel in the “third year of Cyrus, king of Persia.” Cyrus, the Persian king who had conquered the kingdom of Babylon, made a proclamation in the first year of his reign that the exiles should return to Jerusalem and that the Temple should be rebuilt (2 Chronicles 36:22-23; Ezra 1:1-4). Daniel himself lived in Babylon “until the first year of King Cyrus” (Daniel 1:21). Therefore, this final vision of Daniel occurs after the exiles have returned from Babylon. Daniel himself is not in Jerusalem during the time of the vision, for it happens while he is near the Tigris river (Daniel 10:4). He has moved from Susa, the Persian capital further east (Daniel 8:2), westward as far as the river, but it is not clear whether he is now dwelling there or travelling. While in mourning, Daniel sees a vision of a man. While some of the details differ, this man is the same as the appearance of the Son of Man to the Apostle John in Revelation 1:12-20. “Beryl” in Daniel 10:6 is too vague a term to determine actual color, but the wheels of Ezekiel’s vision are described as shining beryl (Ezekiel 1:16; 10:9), which may suggest that this word is meant to describe the brightness of the man more than the actual color of his body. The primary difference between Daniel and Revelation is that the Son of Man in Revelation holds the seven stars (the seven angels), stands among the seven lampstands (the seven churches), and has a sword going out of His mouth. However, Christ tells John that “I died, and behold I am alive forevermore” (Revelation 1:18). Therefore, the victorious Christ appears to John, while it seems that Christ who was yet to come appears to Daniel. The message in both cases is also the same. Christ raises up Daniel and John, both of whom had fallen as though asleep or dead at the sight, and gives to them a message of what is to come (Daniel 10:10-11; Revelation 1:17-19). 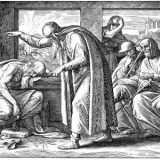 John suffered because of Christ and was on Patmos; Daniel may have been suffering because of the arrogance of the Persian kings (Daniel 10:13). Daniel 10-12 and Revelation as a whole therefore have the same purpose: they are a message to those suffering of what is to come so that they would not lose hope. God in His Providence will bring all these things to an end, and He will reign triumphant. “The kingdom of the world has become the kingdom of our Lord and of his Christ, and he shall reign forever and ever” (Revelation 11:15). “But be on guard; I have told you all things beforehand” (Mark 13:23). Daniel 11, being a detailed historical overview from the time of the vision until the time of the end, therefore shows that God knows all things. History does not just happen by accident. While an exhaustive overview of this chapter would run too long, it might be enough to say that Daniel 11:1-4 describes Alexander the Great, his conquest of the Persian empire, and the division of his kingdom after his death. This may only be seen clearly after the fact, which should drive home Christ’s warning that “concerning that day and hour no one knows, not even the angels of heaven, nor the Son, but the Father only” (Matthew 24:36). Daniel is not given a key to determine by current events where he is on a timeline. Daniel himself is told “Go your way, Daniel, for the words are shut up and sealed until the time of the end” (Daniel 12:9). But even if we do not know when the Lord will accomplish His purposes, the prophecy tells us very clearly that it will come. It is a divine comfort to know that, even though we must wait, God is in control of all things. Michael, however, figures into this prophecy of the end, but he is not the main focus. He is described as “one of the chief princes.” He assisted God the Son in opposing the kings of Persia (Daniel 10:13). He also is described as having “charge of your people,” or perhaps “standing over” (Daniel 12:1). Angels therefore aid the Lord in carrying out His work, including His judgments, and they are also set over His people for their good (also perhaps over individuals in Matthew 18:10). All of this may be inferred from the readings, to be sure, but it is not the main point of Daniel 10-12. One should be wary of choosing texts solely because of word associations.